I got a first look at Crumbs at the Boston Festival of Independent Games where it won Best In Show. There was always a crowd at the table to play and near the end of the day I was able to squeeze in and see it. It was worth the wait to see this cute park themed game. Crumbs is live on Kickstarter and will run until April 21st. Check out the Kickstarter here. 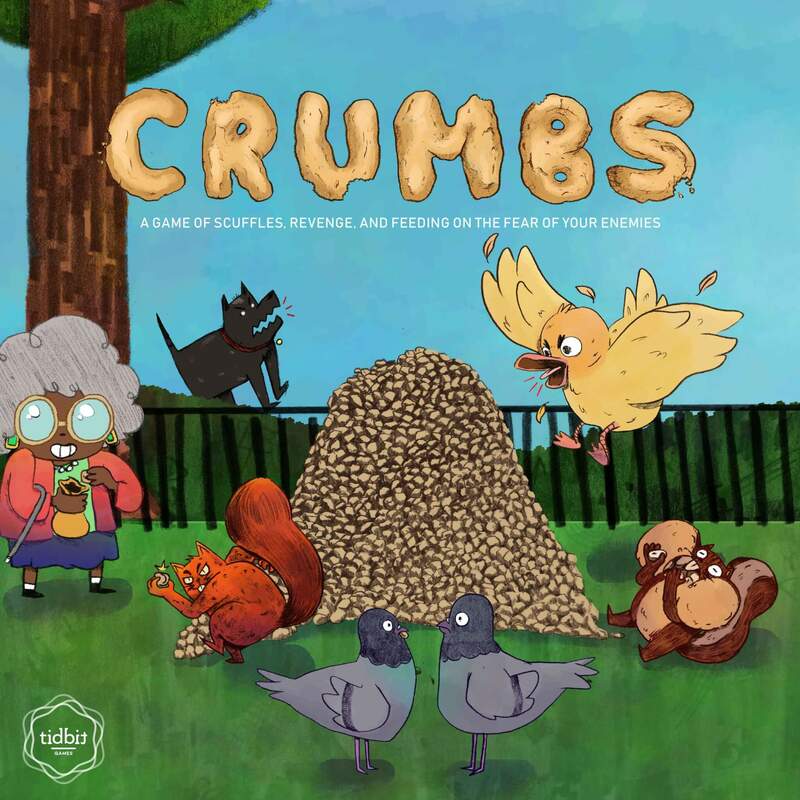 Crumbs is an area control/take-that game that takes 30-60 minutes to play. It is recommended for ages 10 and up. Those looking to crush their friends in a winner-takes-all battle for superiority and control will be delighted to find themselves duking it out in a fresh new setting: your ordinary city park. 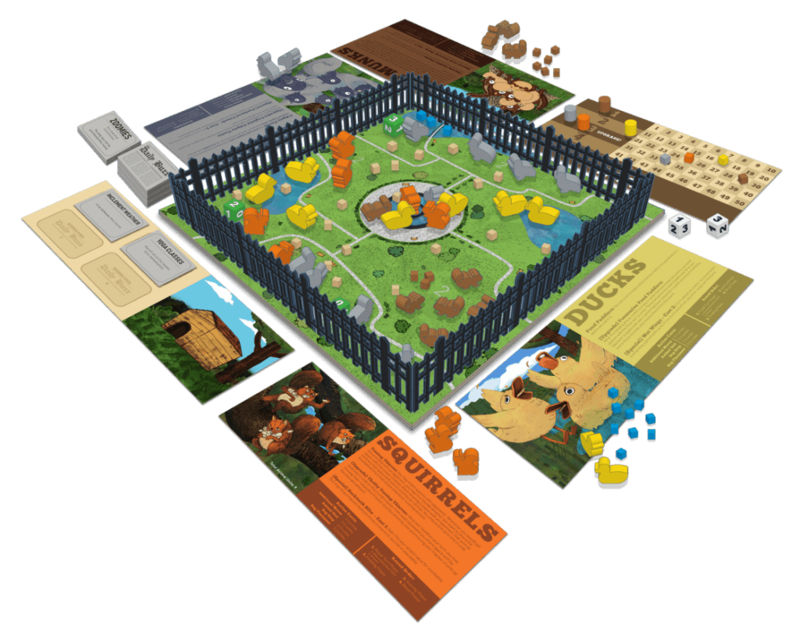 Players take on the role of either the ducks, pigeons, squirrels, or chipmunks. Each group of animals provides its own special abilities while players scuffle over the spaces in the park. Players try to gain the best position before the big crumb drop in which 20 crumbs are dropped onto the board, spreading out at random and turning the tides of power for better, or for worse. Complete! Of course, there’s the never ending stream of minor tweaks here and there when striving for perfection. But the game is in a really great place and is ready for production. Well one day my friend was just like “I like pigeons. I want to make a game about pigeons.” You see, pigeons are a truly underrated animal, they’re always getting the short end of the stick. Everyone is always dismissing them as dirty sky-rats, which may have some truth to it (perhaps rats are a bit underrated as well, ey?). Well we came up with a basic concept for how the game would work, and Crumbs quickly became all about delivering a ferocious battling game in the cute unassuming guise of everyday park animals. The juxtaposition has really spoken to a lot of people. It started with a simple concept: city park, paved paths separating the territories, crumbs dropping onto the board and animals fighting over the territories to get them. That was it! It just took a lot of trial and error and a lot of iterations and rule changes to get the game juuuuust right. It’s FUN. You can set it up quickly, play in under an hour, and have blast demolishing your friends and family as a cute little chipmunk. So many. In game design, every time you change one little thing, the effect ripples through every aspect of it. It looked like the game Dominant Species because most of the pieces (including the box!) were from Dominant Species (fitting name, huh?). We utilized it’s wooden pieces and little wooden cubes, and drew our map directly onto the inside of the game cover with pencil. Back then there was no plastic fence pieces to keep the crumbs inside the game board, rather, we had the game board sitting inside of the bottom lid of a game box. It was so hard to see inside though! One 3D printer and many iterations later and I had a prototype as near to the real thing as could be! I love playing games. What better way to spend my time than creating something I love! I want to make a variety of games that appeal to everyone. Ideas are constantly flowing and being bounced around for new and exciting projects.